ELAN Media, the leading company specialising in crafting innovative communication and advertising landscapes across a mix of media channels, announced the launch of its latest Digital Out of Home assets in Doha Festival City (DFC) this week, namely; The Torch and The Runway. 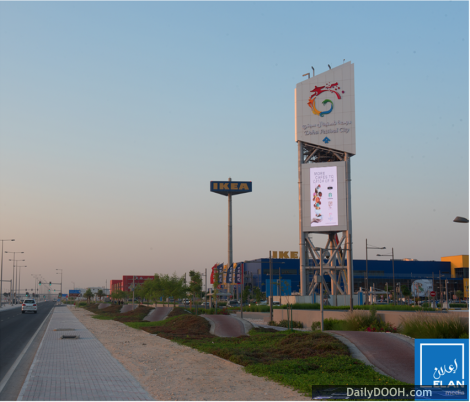 The Torch is now the largest Digital out-of-Home roadside screens in Qatar; each portrait screen stands at an impressive 50 square meters facing both carriageways of one of the main arterial roads in Qatar, Al Shamal Highway. Using the latest Daktronics technology, ELAN Media offer the best LED color definitions in the region. The Runway is an innovative collection of eight sequential digital screens wrapped around the pillars of DFC’s signature food court and entrance to the, soon to open, Theme Parks. Consumers have to walk through the virtual runway to access both, creating a real sense of excitement and engagement. The screens are programmed to endure the Qatar heat and humidity. The LED bulbs calibrated to optimize performance under the intense glare of the Qatar sun. The Runway was customized and supplied by Altoona, a leading Italian company specialized in the production of full color LED displays that uses the latest high definition technology and custom built magnetic structures to ensure the 360 degree finish. ELAN Media, was appointed as the exclusive media partner of DFC in 2016 and aims to provide best-in-class turnkey solutions to the Mall, which is expected to receive 20 million visitors per year. ELAN Media is a subsidiary of ELAN Group, a dynamic and innovative company delivering world-class experiences in media, entertainment, events and city beautification. This entry was posted on Tuesday, November 7th, 2017 at 06:36 @317 and is filed under DailyDOOH Update. You can follow any responses to this entry through the RSS 2.0 feed. You can leave a response, or trackback from your own site.